The perfect ghost story for Halloween, Poblocki delivers a frightening tale of the imaginary vs. the real. 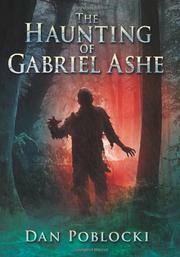 Which defines Gabriel Ashe's current situation? It's never easy to move as a teenager, but sometimes, it's the best thing for a family. For Gabriel, he and his family must move to Massachusetts. The hardest part about moving? Making new friends. Gabriel quickly befriends his neighbor Seth, and the two seem to be bonding well. As most middle school boys do, Gabriel and Seth create a fantasy world much different from their realities. Deep in the woods, Gabriel and Seth take on new personas. The second hardest part about moving? Going to a new school; however, most of the students seem to be taking well to Gabriel. Unfortunately, they don't care so much for Seth. Becoming a little like Nightmare on Elm Street, the lines between reality and fiction begin to blur, as the creature the boys created in the woods, the Hunter, seems to be real, or at least something is tormenting their classmates. A non-stop thriller that doesn't lose its punch after the climax leaving the reader with an ending that is utterly shocking.